The Lord of the Rings The Return of the King Blu-ray Review. The Return of the King boasts an additional 50 minutes of footage incorporated into the movie and surprisingly, it does not impede the final chapter of the Lord of the Ring trilogy by Jackson but rather enhances various facets of the story, especially those scenes that were cut short. The Return of the King (2003), originally titled The War of the Ring by Tolkien, opens with a background into the Gollum character, showing how he came to possess the Ring and how his greed for it eventually destroyed him. Capturing all the power and poetry of Tolkein’s original vision, this final instalment brings the series to a close in spectacular if not exactly economical fashion. The film proved an enormous hit with both fans and critics alike, grossing well over a billion dollars worldwide and winning all eleven Academy Awards for which it was nominated, including Best Picture, Costume Design and Visual Effects. The battle scenes in this concluding chapter are arguably the most expansive and epic of the series, with the siege of Minas Thirith at the hands of the Morgul army incorporating some of the most impressive special effects ever committed to celluloid. As anyone who has seen the trilogy will know, all three films are endowed with innumerable visual strengths. The captivating cinematography and lush, rolling landscapes remain as stunning as ever, from the icily impassable Mount Caradhras to the sweeping grasslands of Rohan. All this would have been irrelevant without the efforts of a first-rate and supremely cast; of course in this regard Lord of the Rings also fails to disappoint. The depth of talent is nearly unparalleled, from the smouldering intensity conjured by Viggo Mortensen as Strider to Christopher Lee’s chillingly evil turn as Saruman. The ensemble cast includes the likes of Orlando Bloom, Cate Blanchett, Ian McKellan, Hugo Weaving and Liv Tyler, and all are at the top of their game. The award-winning Andy Surkis’s voicework as Gollum is likewise highly effective, as are the shrieks and Black Speech of Sauron and his terrifying Ringwraiths. 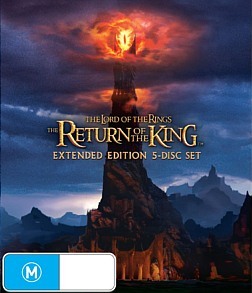 Compared to the previous two previous extended editions of the first two movies, The Return of the King boasts an additional 50 minutes of footage incorporated into the movie and surprisingly, it does not impede the final chapter of the Lord of the Ring trilogy by Jackson but rather enhances various facets of the story, especially those scenes that were cut short. That being said, the intervening decade has perhaps been least kind to The Return of the King. Containing three times as many effects shots as Fellowship, the concluding chapter in the trilogy at times feels a little overburdened with computer wizardry. Nonetheless it concludes the storyline a way that is satisfying, believable and powerful, which after investing so much in the characters and their quest is exactly what the viewer will be hoping for. The wide battle shots are magnificent, and the 1080p picture quality remains clear and crisp at all times. On the audio front the single DTS-HD Master Audio 6.1 ES track is powerful and immersive, with impressive contrast and directionality. Howard Shore’s score is suitably expansive, and the appearance of Clint Mansell’s extraordinarily powerful ‘Lux Aeterna’ theme lends additional potency to the already epic fight sequences. The extended version is cramped with more special features than the amount of orcs that were killed in the films (kidding). But once again, we get some great commentaries by the usual suspects, documentaries, introductions by the actors, special effects and the transfer of the novel to the film. One word best sums up the special features... wow!